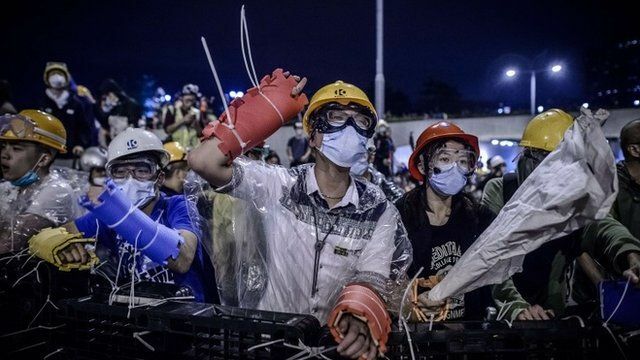 Fresh clashes in Hong Kong protest Jump to media player There have been clashes between police and protesters in Hong Kong, as prodemocracy activists attempted to encircle government headquarters. Police and protesters clash in HK Jump to media player There have been further clashes between police and protesters in Hong Kong. Where now for HK protesters? Jump to media player The removal of the Mong Kok activist camp by the authorities means protests in Hong Kong continue in just two sites. Dozens arrested in Hong Kong crackdown Jump to media player Scores of protesters including two prominent student leaders are arrested in Mong Kok during operations to dismantle protest camps. There have been clashes between police and protesters in Hong Kong, as pro-democracy activists attempted to encircle government headquarters. Demonstrators carrying umbrellas, symbols of their movement, fought police armed with pepper spray and batons. The protests were stepped up after police began demolishing one of several camps occupied by the activists during two months of demonstrations. Tom Grundy is a journalist in Hong Kong, who was at the protests.